I have a stack of packages waiting to get mailed out today.Â It’s the prizes from my Finish-a-Long Contest.Â The third and final winner, Heidi from Duluth, won a skein of Misti Alpaca DK donated by Barb at Fabric Works.Â I really love Misti Alpaca.Â I’ve made several hats out of it and just finished a pair of mittens.Â I’m always amazed by the yardage that comes out of one of those skeins.Â For some reason it seems to be the skein that never ends.Â You knit and you knit and you knit, but the ball never seems to get any smaller.Â For instance, I finished the mittens and still have a good portion of the ball left.Â Definitely enough to do an ear-warmer or maybe even a hat.Â It’s not that I don’t have a pretty good grasp on the math; there’s 208 yds in the skein and I probably used about 100 on my mittens.Â It’s just that it feels like so much!Â If I needed to, I could weigh the skein to double check just how much I have, and double check the weight against how much I’d need for a simple hat pattern.Â But really, where’s the adventure in that? To get back on track, Congratulations to Heidi, Diane and Lisa for winning prizes.Â Congratulations to everyone who took part, we all won by freeing up some brain power that those UFO’s (unfinished objects) were hanging onto. I’m going to do a recap of Stitches Midwest, bit by bit.Â Let me just say that every knitter needs to go to something like this at least once.Â The camaraderie of knitters is wonderful.Â The classes are amazing.Â And it’s just plain fun to talk yarn all day (not to mention shop for it all day! ).Â I took 2 classes while I was there, Bohus Stickning and Stashology 201.Â Both were fantastic classes taught by wonderful instructors. I searched the market long and hard for the skein of Madelinetosh Tosh Sock to finish up my husband’s socks.Â I wasn’t able to find the colorway Olivia, but I did find a contrasting color to use.Â I also found Lily Chin walking through the conference center.Â I didn’t realize who she was, but admired the wonderful dress she was wearing. 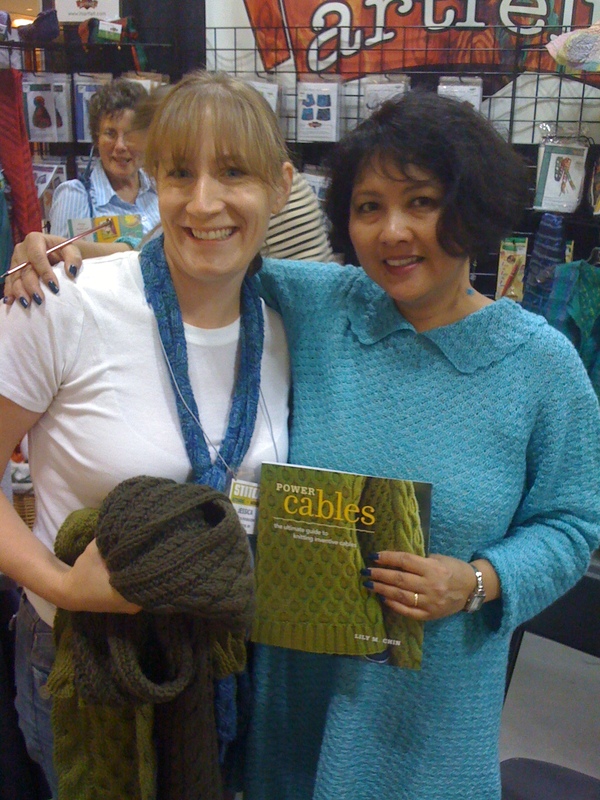 A little while later I saw her signing books at one of the booths.Â I ended up buying the book and complimenting her on her dress.Â She offered to pose for a picture with me and with the scarves she had knitted for the book.Â She also pointed out that I really needed to feel the darker of the two scarves, because it was cashmere.Â I feel a little star struck over the whole thing!Â Lily Chin is definitely a Knitting Rock Star. I just got tipped about your blog by our mutual friend Rosemary Guttormsson. We have been together knitting for the past few days in West Iceland. A private knitting tour organized by Knitting Iceland. Such a wonderful time with such wonderful people. Your blog seems fun… will check in often. Pretty impressive! Not sure who Lily Chin is but she must be super important in knitting circles if she writes books and knits dresses for herself! Congrats to all your finish-a-longers! I got one project in my basket almost done. Next I’m on to your super secret b-day surprise! I’m running out of time! Thanks for the lovely yarn – it is beautiful and so, so soft! My Icelandic knitting teacher, Ragga, has already been in touch with you. I see you had a great time in Chicago. I am coming home from Iceland with 3 new knitting projects. I’m glad I finished my cotton sweater before I left Duluth. Look at you! Getting a photo op with Lily Chin! I am very impressed! Can’t wait to see the husband’s socks with the new “chosen” yarn! Thank you for hosting the Finish-A-Long! It was just the kick in the pants I needed to get my mojo revved up to get those oldies done so I could have the needles back! Love the new look of the blog and Stitches sounds awesome! !